Gaetz’s tweet and the video in question appeared just a day after that. Without offering evidence, Gaetz implied that liberal billionaire George Soros or nongovernmental organizations were paying the migrants. All of it seemed outlandish. It’s no secret that rampant violence and poverty in Central America have spurred thousands of families to flee for the United States in recent years. “Time to investigate the source!” Gaetz tweeted. Let’s take him up on his call to action. The one-minute video clip Gaetz tweeted shows no direct evidence of Democrats, NGOs or Soros-funded groups paying migrants. What the video does show: dozens of people separated by gender are standing in loose lines along a roadside. Many of them are carrying bags or backpacks. Two men in white T-shirts and jeans make their way down the lines handing out what appears to be cash (red-and-white rectangular bills). One of the men is seen carrying a handgun in his waistband. The other is wearing a baseball cap that says “Fox,” the logo for a clothing company. The cash being handed out appears to be Guatemalan currency. Gaetz’s video is grainy and hard to parse. But a Facebook video of the same scene, which was posted before Gaetz’s tweet, has a sharper resolution. But who are the men? Why is one of them armed? And where did the money come from? George Soros or U.S.-backed NGOs. Soros, a Hungarian American businessman who is Jewish, is often cast as the boogeyman in right-wing conspiracy theories. But usually his critics make a bare effort to scare up at least some trace of evidence to support their case. Gaetz didn’t even try. Anyway, the Open Society Foundations, which is funded by Soros, was quick to say that neither it nor Soros was “funding this effort.” Regional experts say that U.S.-backed NGOs have worked to increase public safety and economic stability, mitigating the insecurity that often contributes to why people flee in the first place. We couldn’t find any evidence that an NGO was behind this effort to hand out cash in Guatemala. Democrats. Trump at his rally hinted that Democrats might be behind this caravan. There’s no evidence to support this theory. In a video message in Spanish, the acting U.S. ambassador to Honduras said to migrants: “Please, go back to your country. You are being deceived with false promises from political and criminal leaders.” That’s a vague statement, but it doesn’t make reference to any fanciful theories about Soros, Democrats or NGOs. Instead, the statement suggests that internal Honduran politics is behind the exodus. The White House did not respond to our questions. Chiquimula residents. Reports from journalists and nonprofits following the caravan have noted that Guatemalan locals have been providing water bottles, spare cash and other supplies to support migrants on the long journey to the U.S.-Mexico border. A photographer from Agence France-Presse in Guatemala confirmed this, saying locals often provide money, food and clothes to migrants, though he could not say that’s what was happening in this video shared by Gaetz and Trump. But that doesn’t really explain the presence of an armed man or the organized effort to distribute cash. Annie Bird, director of the Guatemala Human Rights Commission, said it’s not unusual for people to carry arms in Chiquimula, unlike in other parts of the country. It’s a mix of safety concerns and local culture, she said. Other experts confirmed Bird’s assessment, noting that because Chiquimula is along a migratory route, many of which are controlled by narcos, it’s typical to see an increase in security. UPDATE: The cartels. Gaetz told the New York Times he, “now suspects that the men handing out money were cartel members trying to sow good will and subvert the government.” Given the location and the presence of armed personnel, initially, this seemed likely. However, experts noted cartels work in consort with the coyotes who profit by smuggling people to the U.S. border. In other words, it would work against their interest to support the caravan. Multiple reports from nongovernmental organizations active on the ground have said that the movement was organized and grew organically. That’s not hard to believe. There are plenty of reasons to emigrate from Honduras. There is the massive and rising poverty level. The worsening security situation, as gangs extort and destroy small businesses. And all of that before noting that more than 10 people are killed a day, on average. Plus, moving in a large group provides protection for individuals, saving the expense of a coyote to shepherd them through the journey north. While we haven’t been able to pin down exactly who was distributing cash in Guatemala, there is no evidence to back up claims that Soros, U.S.-backed NGOs or the Democrats are secretly organizing this caravan. As always at The Fact Checker, the burden of proof is on the speaker. This seems to be a cherry-picked video reused as a political scare tactic. 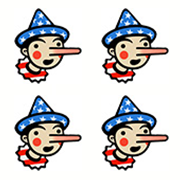 For their willingness to promote propaganda, Trump and Gaetz earn Four Pinocchios.